Tennis elbow is one of the most common causes of elbow pain that I see in our office. Despite the name, the majority of my patients are not tennis players! People from all walks of life can be affected – including office employees, construction workers, and weekend warriors – but tennis elbow is most often diagnosed in patients between the ages of 30 and 50. The name “tennis elbow” probably originates from the classic backhand swing in tennis, which places the muscles and tendons on the outside of the elbow at risk. These muscles are responsible for bending the wrist backwards (wrist extension) and stabilizing the wrist during forceful grasping with the hand. Frequent, forceful gripping and squeezing with the hand during daily activities can also increase the risk of tennis elbow, not just playing tennis. Patients with tennis elbow often localize the pain to the bony prominence on the outside or “lateral” part of the elbow. This area of the humerus bone is called the lateral epicondyle, and it is often very tender to the touch. The pain is typically increased with using the hand and arm forcefully such as lifting a heavy briefcase, weight training, or playing sports. Lifting something heavy with the palm down (forearm pronated) is often more painful than lifting with the palm up (forearm supinated). However, light use of the hand – even lifting a cup of coffee – can cause intense pain in some patients. This can make the arm feel weak and less functional. In general, swelling, bruising, and clicking in the elbow are not symptoms related to tennis elbow. The medical term for tennis elbow is “lateral epicondylitis” because the condition was previously thought to be caused from inflammation of the lateral epicondyle. As you may have noticed, in medical terms, itis means “inflammation.” However, researchers have shown that the condition isn’t actually due to inflammation, as the name would imply, but rather due to musculotendinous degeneration. 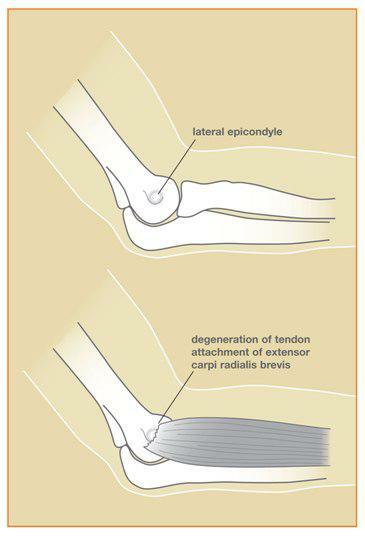 The extensor carpi ulnaris brevis (ECRB) tendon on the outside of the elbow weakens and microscopic degeneration of the tissue fibers occurs. As in most injuries, the body attempts to repair itself. However, if the tendon is unable to adequately heal before it is exacerbated again, tennis elbow pain can develop. So, as it turns out, the terms “tennis elbow” and “lateral epicondylitis” are both inaccurate. But since they have been used so frequently for years, they are still in our medical vocabulary today. How Could I Have Tennis Elbow Since I Don’t Play Tennis? Conservative care is the first-line treatment for tennis elbow. Commonsense treatments such as rest, heating packs, and over-the-counter medications are usually tried by patients prior to visiting the doctor. Occupational therapy, stretching exercises, splints, and corticosteroid injections are commonly prescribed non-operative treatment options for patients with tennis elbow. Fortunately, the majority of patients improve with conservative care. However, tennis elbow can be frustrating for patients because the symptoms can take several months to completely go away. Surgery can be considered if the tennis elbow pain is lifestyle-limiting and conservative treatment has not been successful. The goal of tennis elbow surgery is to relieve pain by removing or “debriding” painful degenerative tissue within the ECRB tendon. Although surgery for this problem is not a “quick fix,” it can be successful to help patients get back in the game. Recovery from surgery can take 2-3 months. Please talk to your doctor if you have more questions about tennis elbow. Click here for tennis elbow home exercises. Image and video copyright American Society for Surgery of the Hand.